Skewed justice: Verdicts for sale? 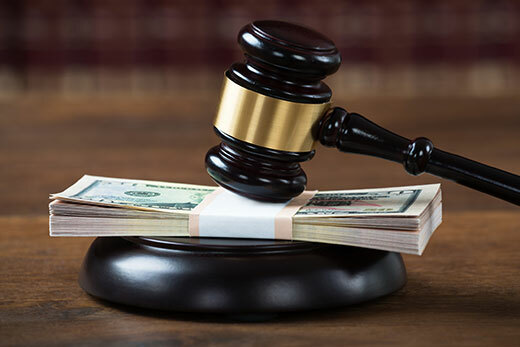 Emory Law professors Joanna Shepherd and Michael Kang study how political money and increasingly vicious attack ads influence the actions taken by judges in criminal courts. At a time of ever-increasing influence of big business, “SuperPACS” and powerful nonprofits in American politics, most savvy voters understand that politicians facing a tough election year can be, and often are, forced to take positions based mostly on money — and the advertising power that money can provide them. It’s hardly a new trend, and though efforts have been launched to tamp down the power of mega-donors, those efforts have been rebuffed. So it remains that, from municipal elections to the halls of Congress and all the way to the Oval Office, money is more essential to the business of politics today than ever before. According to two researchers from Emory Law, however, the ever-widening impact of money and so-called attack ads is starting to impact not just how laws get made in this country but, frighteningly, the way criminal trials are conducted as well. Starting with the publication of their powerful 2014 study, “Skewed Justice: Citizens United, Television Advertising and State Supreme Court Justices’ Decisions in Criminal Cases,” professors Joanna Shepherd and Michael Kang have been investigating and uncovering the extent to which political money and increasingly vicious political attack ads have begun to influence the actions taken by judges in criminal courts. “These attack ads didn’t really exist prior to 2000, and then you started seeing a small uptick,” Shepherd explains. “They kept increasing, and then by 2006, what we started seeing was that these ads almost solely addressed justices’ opinions in criminal cases [accusing them of being soft on crime]. In the study that resulted — one that drew attention from media outlets nationwide, including the New York Times — Shepherd and Kang concluded that the surge in spending on attack ads in state court elections (a surge they connected directly to the still-controversial Citizens United decision) had made judges less likely to rule in favor of defendants in criminal appeals. Additionally, they found that that justices whose bans on election spending were struck down by Citizens United were 7 percent less likely to vote in favor of criminal defendants than they were before the decision. The findings were certainly shocking. But according to David Lyle, director of the state courts project for the American Constitution Society — a 15-year-old legal organization committed to promoting “individual rights and liberties, genuine equality, access to justice, democracy and the rule of law”—they weren’t exactly surprising, at least in the legal community. For some time, Lyle said, attorneys, judges and other legal insiders had suspected that political finance issues were beginning to directly impact criminal cases. They had heard stories. They had seen things that made them raise their eyebrows. What they hadn’t been able to put together, he said, was proof. Importantly, Lyle notes that the study also made an impact outside of the legal world. Within a month of its publication, Shepherd and Kang’s findings were covered three times in the pages of the New York Times alone. The media attention hinted at the power of the findings and offered hope that, with greater understanding of the issue in the public sphere, change would be possible. “I think it struck everyone that the role of money in elections is not just a concern for lawyers and judges, but rather that it needs to be a concern for everyone, especially for those who care about criminal justice issues," Lyle says. But does that newly developed awareness mean change is likely? Shepherd, Kang and Lyle are hardly optimistic. Shepherd and Kang say they believe the viciousness of attack ads is only getting worse — a potential sign that the “tough-on-crime” backers of these ads see that they are, in fact, worthwhile investments. They also note that their more recent research is turning up evidence that judges backed strongly by political parties are more likely than others to vote along their preferred party affiliation in cases of contested elections. Lyle, meanwhile, seems convinced that unless Citizens United is ultimately overturned, the status quo will remain. “Until that time comes, the solutions are going to be very challenging to find,” he says.